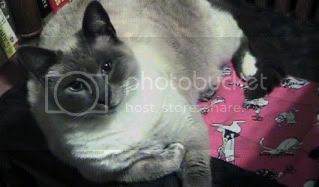 Pootie Pads are small, cushy quilts for cats — with catnip quilted in. You probably need at least one per pootie. Studies show, cats don’t like to share their Pootie Pads. If your mail contains a Pootie Pad, don’t leave the package unattended. Clever paws will open it for you, otherwise. 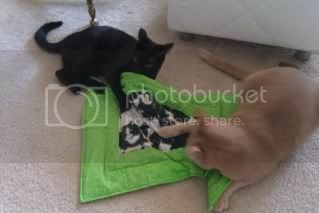 We are hearing reports that older cats enjoy playing with a Pootie Pad. 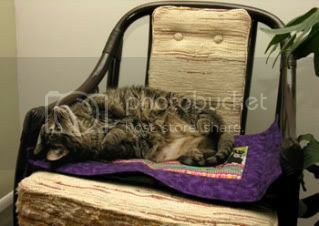 Older cats also like to nap on a Pootie Pad. We are also hearing that pooties that were once feral and who are still shy have come to sit with a hooman who has a Pootie Pad in their lap. Pootie Pads become a piece of portable territory – when a Pootie Pad is moved, a cat will tend to go where the pad is put. Evidently, there is comfort in catnip. Well, with a Pootie Pad, the catnip is quilted in — lots of it. We are using organic, GMO free, Oregon Tilth certified catnip — and the kitties love it. Find Pootie Pads on Facebook, follow on Twitter: @PootiePads.